Notice: Bloodsucker will be available after the version update on Nov 25, which means you cannot recruit Bloodsucker until tomorrow's version update is finished. 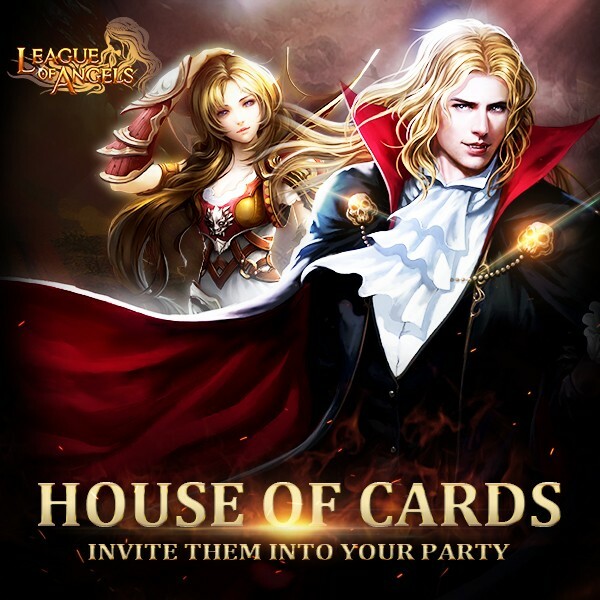 - You can swap the required cards for: Bloodsucker, Lunar Priestess, Crescent Elf, Fame Hunter, Dark Paladin, Ghost Paladin, Headless Horserman, Dragon Queen, Dragon Empress, Yasi Delaney, Poseidon, Earthshaker, valentina, Fallen Angel, Namiria, Exiled Arrow, Lvl. 7 Cherubstone, Khaos Core, Purgatory Soul, Lvl. 5 Aeolus Glorystone, Lvl. 5 Brooky Glorystone, Lvl. 5 Flaming Glorystone, Lvl. 5 Shadow Glorystone, Lvl.12 HP Gem, Lvl.12 Dodge Gem, Lvl.12 END Gem, Lvl.8 Dodge+Hit Gem, Lvl.8 Crit+Hit Gem, Ruby Dragonsoul Pack, Ruby Herosoul, Spring of Wisdom, Blessed Stone, Elemental scroll, Magic Socketing Rod and many more! - Total Ranking Rewards: At the end of the event, the Top 20 players with at least 20,000 total points have a chance to win Joker S, Lvl. 8/7/6 Fusion Gem Chests. Description: Reach following requirements to swap for great items and Joker (S)! More exciting events are coming up through Dec 3 to Dec 6 (Server Time), check them out in the in-game Hot Events menu now! LoA_Wheel of Luck:Win Chaos Compass For Themis! LoA_Angel Exclusive: Take Hemera and Awaken Her! LoA_Special Rose Ranking Event, Pray For SilverWin! LoA_Lucky Tree: New Powerful Sylph Saintly King Joins Us! LoA_Awaken Polly in Rose Rankings!